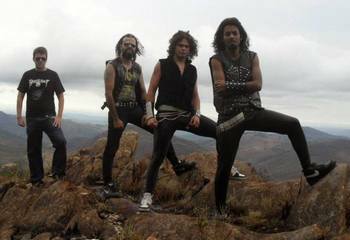 This heavy metal band was founded in 2012. A string of demos with titles like By the Power Of Crom, Die By The Steel, The Elephant Tower and The Frost Giant's Daughter and Thor followed. Golden Axe in 2013 ended up being the band’s last before two full-length demos simply called Grey Wolf (Chris Maia was now on guitar) and We Are Metalheads. Grey Wolf's album was released on June 18th through Arthorium Records. The CD was entitled Glorious Death and featured a booklet with 16 pages and cover artwork painted in traditional media by French illustrator Nicolas Bournay. The founder of Grey Wolf, Fabio Paulinelli, who also assumed the roles of bassist, singer and composer announced in early 2017 that the band was ceasing its characteristic multi-member formation and returning to being a one-man studio project, at least for a while. The man had severe tendinitis and would focus more on special performances. Nonetheless, a new album was being composed. Grey Wolf’s The Beginning was a 2017 compilation of material culled from the band’s six demos between 2012 and 2013. During this period the band was an actual group and not a solo project.